What is the difference between Botox and fillers as an alternative to a facelift in Baltimore? Many people looking for a facial rejuvenation alternative to a facelift in Baltimore consider Botox or facial fillers. What a lot of people don’t realize, is that they are not the same. It’s true that both are non-surgical options and they are also both injectable treatments, however they fight aging in different ways and are made of different substances. 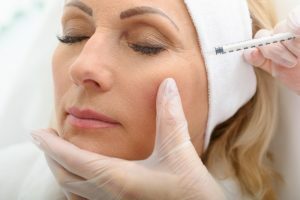 Those seeking facial rejuvenation in Baltimore who choose Botox are looking to treat wrinkles around the eyes, on the forehead, on the neck, and between the eyes. The substance used is an injectable that is a purified protein neurotoxin which is meant to minimize the appearance of wrinkles. Botox works by temporarily paralyzing muscles that are used during specific facial expressions, preventing them from causing wrinkles. The results typically last between four to six months and require ongoing treatment to maintain. When a plastic surgeon in Baltimore who is a member of the American Board of Plastic Surgery performs a facial filler treatment, he or she is using injectables that contain collagen, calcium hydroxyapatite, or other substances to treat wrinkles around the mouth and nose, under the eyes, or on the cheeks, jawline, lips, and chin. Filers accomplish this by adding volume to these areas and lessens the appearance of wrinkles. Areas that are thinning are filled out, creating smoother skin and filling smile lines and other folds. Depending on the filler used, these results can last between six months and two years. Again, in order to maintain results, further treatment will be necessary. Choosing between Botox and fillers is a personal choice and mostly depends on the areas you wish to treat. Discussing your goals with a cosmetic surgeon will help you map out a treatment plan that is right for you. For more information questions about a facelift, Botox, fillers, or any other plastic surgery in Baltimore, do not hesitate to reach out to Dr. Jeffrey Schreiber and the Baltimore Plastic and Cosmetic Surgery Center. Our friendly staff will happily answer any questions or schedule a consultation. Call (410)205-1846 today.